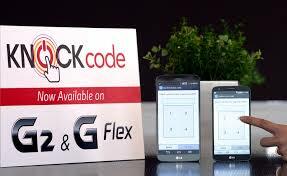 ItVoice | Online IT Magazine India » LG G2, G Flex Set To Get Knock Code! April 21, 2019 10:51 pm You are here:Home Computer HardwareLG G2, G Flex Set To Get Knock Code! LG G2, G Flex Set To Get Knock Code! LG has announced that the company will begin releasing the new LG Knock Code feature for the LG G2 and G Flex smartphones. The new add-on will be made available with the latest software update that will start from April. The LG Knock Code is a an upgrade from the LG Knock On feature that has already been introduced in the LG G2. LG claims that the new Knock Code enables users to wake the smartphone and also unlock it in just one step. Successor to Knock On, the LG Knock Code works smartly by dividing the display of your phone in four segments that are obviously not visible to protect the security of the device. You can then knock in a specific sequence, anywhere on the screen segment from two to eight times. While, the new handsets like G Pro 2, L-series III, G2 Mini and new F-series smartphones by LG already carry the Knock Code feature.